Welcome to my floor plan for the Madison Avenue offices of Sterling Cooper Advertising aka Mad Men. This is the 22nd floor and features Bert Cooper and Duck Phillips' offices. Also on this floor is Harry Crane's second office along with offices for Ken Cosgrove and Sal Romano. This floor houses the various departments at the heart of Sterling Cooper including: the production department, casting department, the sound room, observation and research room, accounting and finance, media department, art department, the mail room, screening and projecting, and the research department. In Bert Cooper's office you'll find his Marc Rothko painting on the wall along with oriental screens and cabinets. Make sure to take your shoes off before entering. Offices for Roger Sterling and Don Draper are on the 23rd floor along with the various other offices. 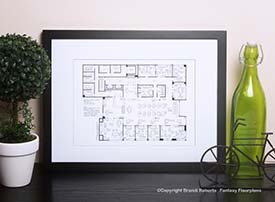 Check-out my entire collection of Mad Men floor plans including: the 23nd Floor of Sterling Cooper Offices, the 37th Floor of Sterling Cooper Draper Pryce, Don and Betty's Ossning house, Don Draper's bachelor pad apartment, and Megan and Don's swanky New York apartment. 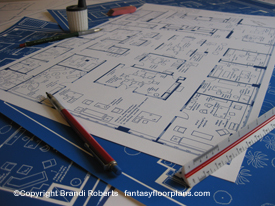 Buy all my Mad Men office floor plans as set here. Or purchase my floor plans for Don Draper's residences as a set.